“That Little Dude won’t be happy unless he is flying moch 3 with his hair on fire . . . wow is he a dare devil! The Wiggles are creepy and so are a lot of other kids shows. Just know that most shows spend time and money researching the learning and entertainment from the kids’ perspective. And enjoy! Ah, that Lady in the Shoe, as witty as she is wise. Nice Top Gun quote; touche. And great Wiggles input; gracias. But the point I would like to emphasize is her PS. Well, thanks for pointing out that the swing was looking grungy. Are you picking up on the sarcasm? There’s a little layered in there. The Shoe Lady’s comment gave me a great reason to crack the whip. Mrs. Dude had to take some advanced engineering classes to figure out how to get the swing off the stand, but Lady in the Shoe, you’ll be happy to know we are no longer sitting our child in filth on a regular basis…not in the swing anyway. Other than calling us on our lack of hygiene, Lady in the Shoe made an important point. That swing has indeed seen much love over the course of the first 21 weeks of L.D.’s existence. In fact, it has been the sole slumber zone for all 140 nights leading up to this past week. Little Dude fell in love with the swing immediately…as in the first night he arrived home. The constant motion put him out quick and kept him out. We’ve settled into a routine where he’s now waking up once a night to eat, but there were plenty of nights early on where he was giving us a full night sleep in that swinging miracle. However, we received advisory suggestions from multiple sources that mentioned we should have had him out of the swing and in his crib weeks ago. I think the Pediatrician may have been one of those advisory sources. And I think Mrs. Dude may have fibbed about his sleeping locale at the last appointment. Tsk, tsk, tsk. Well, no worries. The dirty secret (literally and figuratively) has been cleansed from our lives. Little Dude is officially a crib sleeper. And the best part is he loves it! We thought it was Little Dude that needed to be in the swing. We thought we would have countless sleepless nights and a cranky little boy when we made the move. We intimidated ourselves into believing that we needed to choose the absolute perfect time to make the transition. And none of that was accurate. Little Dude took to the change immediately. 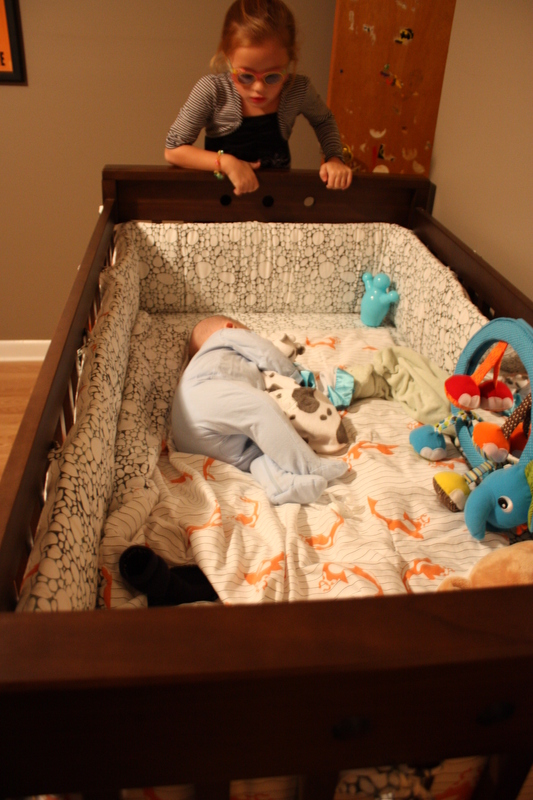 What the crib lacks in motion, it more than makes up for in comfy, comfy roominess. Little Dude loves the space to stretch out. He’s now taking all naps, and sleeping full nights in the crib. So, I guess the lesson for week 21 is don’t stress about changes. Kids will make it work. There may be a few bumps in the road, but no need to wait for the perfect opportunity to change…there’s no such thing as the perfect opportunity. Well, that, and before you post a picture of your child’s swing on the internet, make sure it’s clean. This entry was posted in Dude Knows Best, Lessons from the Front Lines, Little Dude and tagged crib, dirty, Dude, Little Dude, Mrs. Dude, secret, swing. Bookmark the permalink.